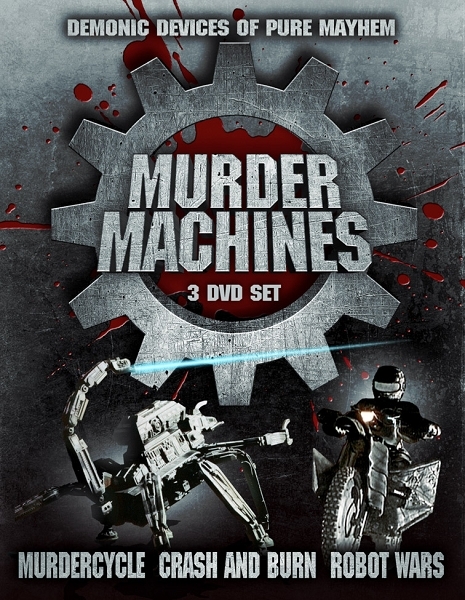 This new collection includes MURDERCYCLE, CRASH and BURN and ROBOT WARS. All three DVDs come together in a special, space-saving slimline DVD case. An alien death machine...Its engine roars with a deafening thunder. Devoid of human emotion, it kills to live. It has torn into our dimension from the Hell of another world. An alien being with a mission to destroy the one person on Earth that prevents its immortality. There is no place to hide - when the Murdercycle has its sights on you. The weapons of the future are alive...It s the year 2030 and man s worst nightmares have become an oppressive reality. Ultra violet rays have punched through the ozone layer and parched the earth, dooming it to eternal summer. And Big Brother has come to life in the form of UNICOM, a multi national corporation that has taken control following a computer induced economic holocaust and various governments defaulting on their national debts. Toward the end of the 21st Century two great powers dominated the world, a division that resulted from a 30-year war known as the War of the Hemispheres. The war came to an end with the creation of giant, indestructible mega-robots designed for military missions and balance of power. With the treaty came peace and both sides merged into one government, the New Federation. 80-foot-tall Mega-Robotic-Assault-System, now used to guard the most dangerous spot on earth. The MRAS-2 now patrols the highly restricted area known as the Crosshair Zone, the site of the Toxic Tomb-a dumping ground for the most dangerous toxic waste. Periodically, lone-wolf terrorist groups try to get to the tomb to gain materials to launch chemical warfare against the New Federation police forces. But MRAS-2 is the most sophisticated weapons system ever built and is indestructible.